Transform arched, triangular, circular, small or even awkwardly shaped windows with our made-to-measure shaped shutters. 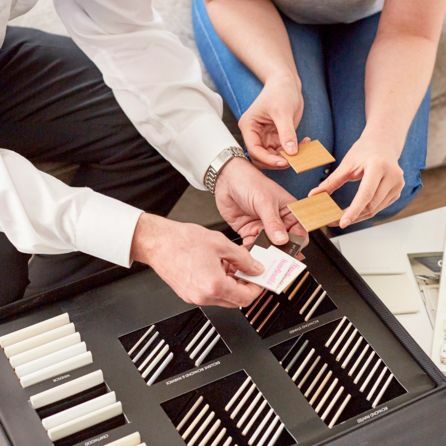 Mark Lucas, our shutters Product Manager, applies his twenty years’ experience to some of the most common queries. Porthole windows are not just for fancy yachts - lots of homes have this charming feature too. And because these quirky window shapes are so loved by British homeowners, it’s important to give them the finest window treatment, like our made-to-measure porthole shaped shutters. If your home has an ornate arched window and you want to accentuate this stylish feature, then we can make arched shaped shutters to fit exactly. Whether you have a single arched window, or a traditional period fan shaped window, we can help. Choose either a made-to-measure arched shutter, or a combination of full height shutters together with a bespoke arched shaped shutter to make up the distinctive fan shape. Even complex geometry holds no fears for our expert advisors. As part of our standard service we carry out a detailed technical survey, accurately measuring ever single angle of your windows to make sure that your made-to-measure triangular shaped shutters look exactly as they should. And because we make all of our shutters to meet your exact specifications, we can advise you on the perfect configuration for almost any shape or size of window, even very small shaped windows, so you needn’t feel constrained by a complex shaped window that’s made up of individual panes of varying sizes. We can make large, medium and small shaped shutters that will work together to form a coherent whole. Is your awkward window in the bedroom, bathroom or dining room? If so, you should start your search for the perfect shaped shutter with our hardwood and craftwood ranges. But if you’re looking to dress a window in the bathroom or kitchen then consider our waterproof design. Our selection of customisable options offers plenty of options to help you get just the right look for your home. You can pick from a range of painted or natural wood finish, louvre sizes, and how you want to open your shaped shutter. Book an in-home appointment and find out more. A Hillarys advisor will come to you, with examples of our shutters and plenty of tips for getting the perfect look. Your advisor will also measure your window and give you a no-obligation quote to consider. So no matter what shape your window, Hillarys can help you get the look you want.